Kevin Parker, a University of Rochester researcher whose discoveries have been widely applied in medical imaging and image processing, has been named a fellow of the National Academy of Inventors. Parker joins 174 other new NAI fellows this year who have “demonstrated a highly prolific spirit of innovation in creating or facilitating outstanding inventions that have made a tangible impact on quality of life, economic development, and the welfare of society,” said Paul Sanberg, president of the academy. Sanberg, senior vice president for research, innovation, and economic development at the University of South Florida, spearheaded the founding of the academy in 2010 as a way to highlight academic invention and the important role that patents play in university research and innovation. Inventors from governmental and nonprofit research institutions are also among the 757 fellows now honored by the society. Parker is the first fellow to be named from the University of Rochester. He holds or shares 25 U.S. and 13 international patents with a range of applications. Blue noise mask, which Parker invented with then graduate student Theophano Mitsa ’91 (PhD), is a widely adopted half-toning technique that prints shades of gray in less time and at a higher quality than traditional methods; it has been licensed by more than a dozen companies, including Hewlett Packard. (Read more about the invention and its commercial impact.) It has generated more than $54 million in royalties for the University, one of the three most lucrative inventions in the University’s history. A series of patents Parker obtained with Robert Lerner, a former associate professor of radiology, and Ron Huang, a graduate student, helped launch the field of sonoelastography, which offers novel ways to measure tissue stiffness. And a series of ultrasound, MRI, CT scan, and biomarker patents with Saara Totterman, a former professor of radiology, and graduate student Jose Tamez-Pena led to the founding of VirtualScopics Inc., a provider of clinical trial imaging solutions. Most recently, Parker and the University have applied for a provisional patent for a new technology Parker developed that uses color coding to reveal fine details that have previously been obscured in ultrasound images. When Parker and Mitsa were awarded the University’s Eastman Medal in 2014, Parker described how a “virtuous cycle” of academic research can lead to inventions, then patents, and then royalties that come back to the University to fund new research and education programs, priming the cycle to begin anew. 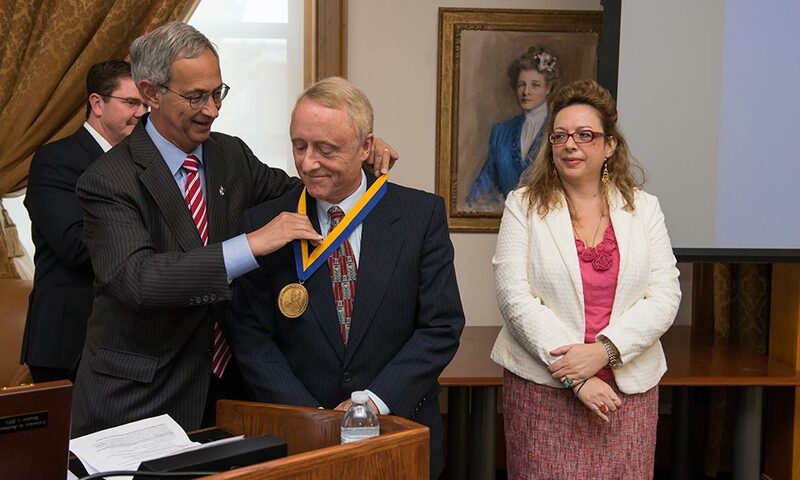 Richard Waugh, then chair of the Department of Biomedical Engineering, related at the award ceremony how the department was created in 2000 after receiving two initial $1 million grants from the Whitaker Foundation. When the department then approached the foundation with an even bigger request, to help fund a new building and further expand its faculty and programs, the foundation insisted the University demonstrate a serious, permanent commitment to the new program. Parker convinced the University use some of blue noise mask revenue to establish two endowed chairs in medical engineering as part of the match, Waugh said.